Six years ago I was diagnosed with cardiomyopathy and was placed on a heart transplant list. I began taking Optimum Health's Coenzyme Q-10, was taken off the transplant list, and have since made a full recovery. We are very pleased with all of the nutrients we have gotten from Optimum Health. We have been purchasing them for years and will continue to do so. Since using your Derma Q-Gel Cream, my skin feels smooth, supple, and without wrinkles at 50 years of age. Many people have since remarked about the quality of my skin. "Twelve years ago I was diagnosed with congestive heart failure. I have recovered by taking cardiac medications but continued to have chest pain and angina. For the last 10 years, I have been taking Optimum Health L-carnitine Fumarate and Coenzyme Q10 supplements and no longer experience chest pain or angina." Seven years ago I purchased the book "Optimum Health" by Stephen T. Sinatra. Since that time I have developed a diet and nutritional regimen that has improved my overall health. I have come to depend on M.D. 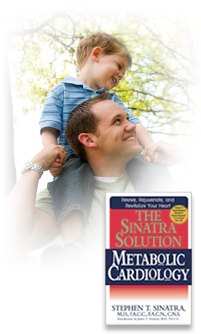 Designs supplements and have since purchased all of Dr. Sinatra's books. I especially enjoy many of the recipes included in some of them. "Optimum Health" has become my bible for wellness. After having used your Norwegian Fish Oil softgels for 4-5 weeks, I have found that my problem with dry skin has completely disappeared. "I have been taking Optimum Health Coenzyme Q10 and L-carnitine Fumarate for three years, and within 3 years, and within 3 days it increased my aerobic capacity during my daily run (up hills). There is a noticeable difference in both pulmonary and muscular respiration." "By using your Coenzyme Q10, L-carnitine Fumarate, and Norwegian Fish Oil supplements, my lipid levels have dropped." " I have been taking Optimum Health Coenzyme Q10 and L-carnitine Fumarate for seven years. It has, to my belief, contributed positively to my heart condition and extending my life." After taking your Coenzyme Q10 for 4 months, my cardiac arrhythmia episodes went from daily occurrences to occasional ones. This has helped to improve my enjoyment of life.